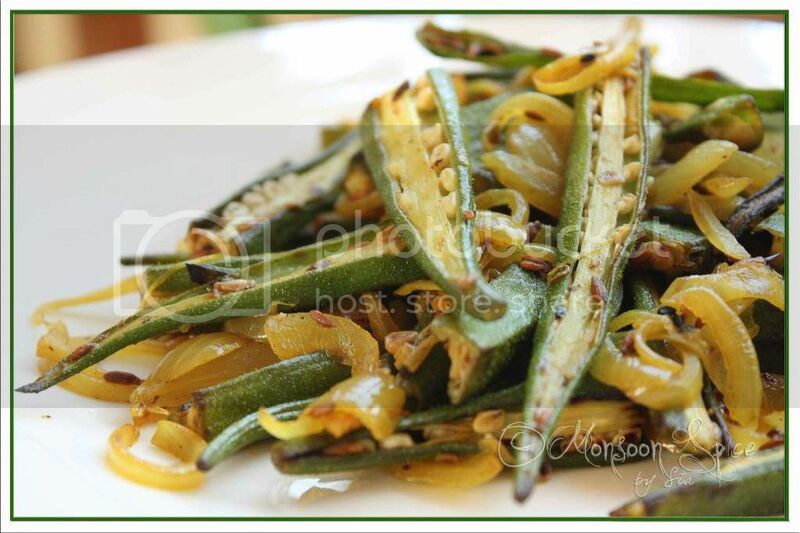 Monsoon Spice | Unveil the Magic of Spices...: Bhindi Do Pyaza: Say No to Slimy Okra! What happens when you balance laptop in one hand, cloths basket in another hand, two coffee mugs dangling from fingers? And imagine same scenario and you are climbing down the stairs, looking back and chatting away to glory? Now we are talking!!! The result of such silly and stupid thing is you end up tumbling down from top stairs to bottom and then end up either with broken bones or severe back pain! That’s what happens when you are not watching your steps!!! Thankfully I didn’t end up with broken bones but suffered enough from back pain and bruises for few days! Never in my life had I felt good about those excess fat around hips ;) That’s the only reason I am walking (hopping/jumping is the right word in my case) without clutches or wheelchair today! Since I was strictly kept away from kitchen or even getting up from bed/sofa (how boring! ), TH was in charge of cooking. So here is my Sous chef, totally in control of everything and cooking one delicious dish after another, not only impressed me immensely with his cooking skill but also giving some tough challenge in kitchen. Looking at the way he’s been cooking storms in kitchen, I am having serious doubt about him starting his own food blog ;) Don’t you believe me? Then how about these crispy and delicious Bhindi Do Pyaza cooked by my much better half? 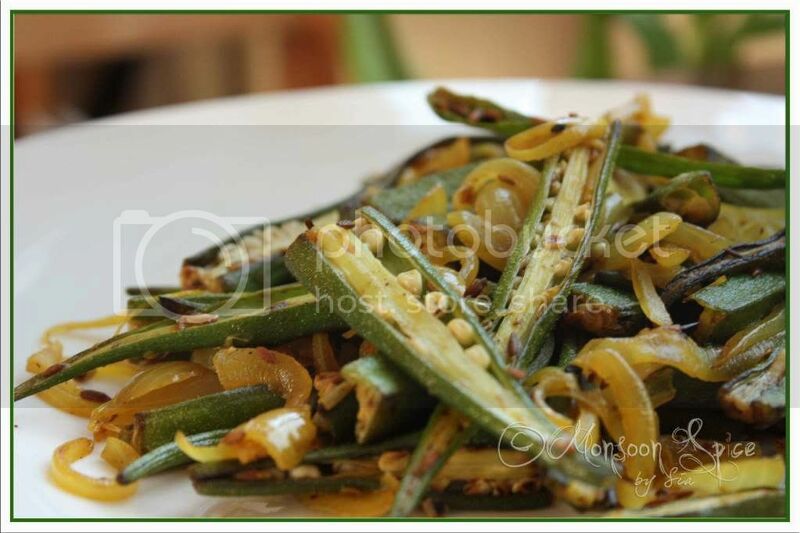 Bhindi Do Pyaza is a simple stir fry of Okras and Onions with just few spices. It’s one of the simple dishes which can give very tough competition to any complex dish. Flavour wise, the combination of crunchy okras and sweet onions can blow you away when cooked right! Only thing that you need to do is stir fry the okras in very high heat, adding right amount of oil and you will be surprised to see how crisp they turns out! So are you ready to say good bye to gooey, mushy okras and welcome this queen of vegetables with a very big hand? Shall we start the party? Heat 2 tbsp of oil in a pan and add sliced okra to it. 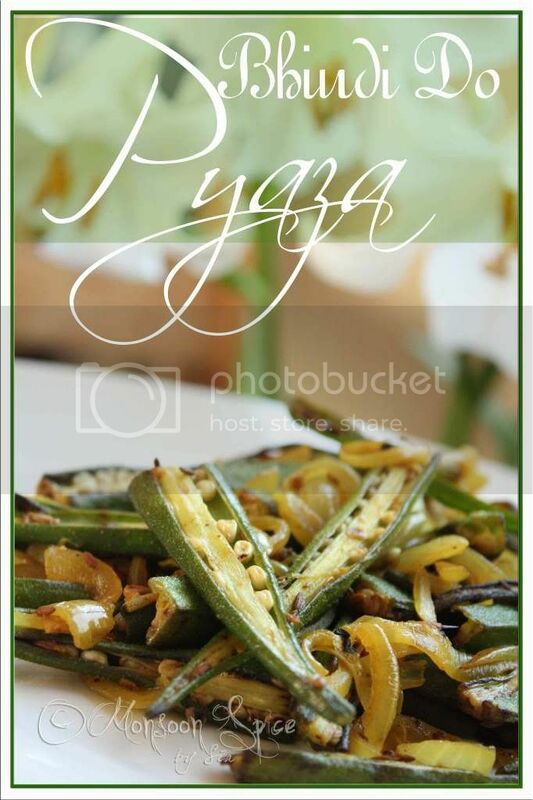 Stir fry on high flame till brown spots start to appear on sliced okra and its sliminess is reduced. It will take good 4-5 minutes for the okra to cook through yet retaining its colour and crispiness. Transfer the stir fried okra to dry plate lined with kitchen/paper towel. Heat tbsp oil in a same pan and add kalonji and jeera seeds. When jeera starts to sizzle and turn golden red in colour, add sliced onions, green chillies and finely chopped ginger and stir fry till onions turns translucent. Add turmeric powder and stir fry till onions turn golden brown. Mix in okra, lime juice and salt to taste and continue to stir fry for another 2-3 minutes for all the flavours to blend well. Serve this delicious Bhindi Do Pyaza with some curry/dal and rice/chapatti and enjoy. Few tips for those who find it difficult to cut, and cook those slimy Okras. Always choose young and tender okras. The best ones are the ones that get easily snapped when you bend the tail end of the pod. Make sure that you dry the Okra completely after washing them in water. Either spread them on kitchen towel in single layer and leave it for few hours or pat them dry with dry kitchen papers/towels. It is a must that the okras are dried properly if you don’t like them go slimy. Next while chopping them; make sure that you have dry chopping board and knife. Keep dry kitchen paper next to you and clean the slime from knife using it whenever needed. I have tried stir frying the okra with very little oil and ended up with really slimy okras. So then onwards I usually use little more oil than normal and cook it on a very high heat. This way the okras not only get cooked fast and retain their crispiness, but also any moisture in them disappears at high heat. And you will be surprised to see how the sliminess is reduced in short period of time. Move over, let the Sous Chef have his own blog ;-) Did he click those amazing pics too ? hope u feel better soon. take care. Oh Sia.. Hope you are feeling alright now. But the looks of it, you might want to stay away from the kitchen for quite sometime now. That bhindi subzi looks delicious, you have trained ur sous chef very well.. good job. Take care. I love bhindi in any form-J treats it like his arch enemy! Take care!! oh boy, that sounds terrible... hope you are doing fine! Bhindi looks tempting! Thats nice of your husband.. doesn't it feel good when you get that extra attention your better half when you are sick/immobile.. ?? Enjoy and take rest..
Wow, your hubby is certainly a good cook just like you! Okra curry looks fabulous Sia! Hope you're feeling better now! Take care! bindi looks perfectly roasted... yummy. What on the earth were u doing those antics for? ! :-) Hope you are feeling better now! BTW the oh so slimy okras looks really not slimy & crispy. I make mine in the same way, but i will add kalonji next time. i love the flavor of kalonji. hope u r doing good now Sia. What were u thinking when u picked up EVERYTHING in ur hands? I guess u missed picking up the kitchen sink! Hope those bruises are ok now.. take care .. Bhindi Do pyaza looks Amazing! ur sous chef has done an AMAZING job!!! So perfectly cooked. I'll have mine with some dhal and rice thank you. Hi Sia, How r u feeling Now?? Nice post and nice recipe. Get well soon. May crispy bhindi always prevail! The pics look great Sia. Love this anytime Sia.I love okras and this is always a family hit. I love okra and am glad that my Dad taught me how to make sure that it was completely dry so that it woudln't turn out sticky when it was cooked. That do pyaaza looks just perfect! OMG..I hope you are feeling better now..
Bbhindi do pyaaz looks great.Love it soo much..As usual great pics! So that's how you fell? You are certainly a multi-tasker! Hope you're all better now...take good care. Looks like TH can cook really good. this looks so yumm i shouldtry it once. so k has the jai syndrome, huh? if you ask him to make x, y or z, he will keep pestering you. where is the fennel? where is the rice flour? if you ignore him or ask him to stop bothering you, he'll figure it out and do a fine job. take a month's break from cooking, sia. let k start posting for a change. get well soon. Sorry abt your back( but you win some when you lose some).Like u might have been unlucky to have a fall but got lucky that you could just sit back and have your hubby make all the good stuff for u. I've always had trouble making okra becos it always ends up slimy. Will try your tips. Get well soon! Hope you are better and back to normal. Hey gal, we got bore of ur rants, hand over to the Chef (not sous-chef) and u take the role of sous-chef. The bindi is cooked with perfection, now i am doubting if all the dish is cooked by him! Sorry about your back dear.Get well soon. beautiful pics! Bhindi looks very appealing and yummy! Awwww, you all sweethearts! thanks a lot for ur wishes:) I am recovering well with the help from my much better half and ur good wishes :) Thanks and love ya all. Hi Sia, the bhindi seems tasty, but i hope your back is ok, i dont think you should multitask, i thought in that chore list you were going to add cooking too.. im glad u didnt..
Oh sia..Hope you are doing fine now.But You are so lucky to have such a caring husband.....and the dish looka yummy..I like okra with plenty of onions in it..
Ouuch, hope you are feeling better now and recovering frm that nasty fall Sia! Yes, looks like you will have some serious competition in your own kitchen, but enjoy it :). Take care and let the sous chef cook;) just kidding!! Oh dear...hope u're alright now. And the okras look great and why shud u crib when u can sit back and enjoy these goodies ? Take rest and savour every moment of pamapering :) The tips are really useful. I used to pan fry them with little oil. They turn to be crisp and tasty too. Hope u r feeling better now :) take care. Lovely pics...bhindi sabzi looks damn neat.